1. Indian passport holders can apply for a Singapore tourist visa that allows a stay for maximum period of 30 days with a validity of 2 years. 2. Similar to other country rules, even for Singapore, you should ensure that your passport is valid for 6 months from the date of entry in Singapore. 3. It’s a multiple entry visa which means that in the given visa validity you can travel multiple times and you won’t have to re-apply for a Singapore tourist visa. 4. 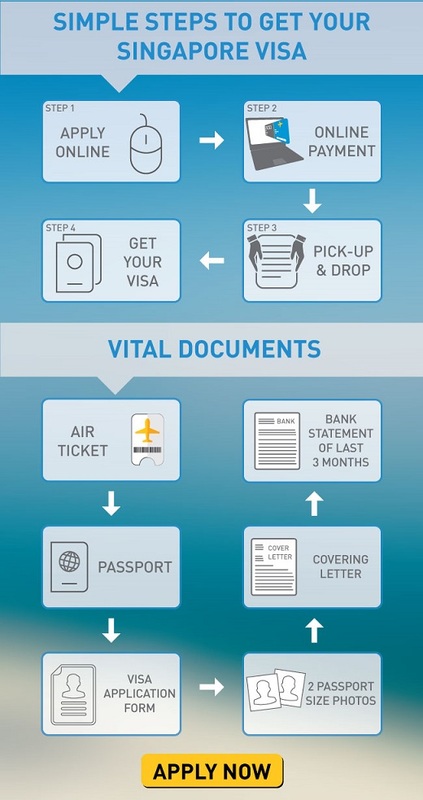 If you are holding any old passport, it is safe to enclose the same with the application form. 5. Two recent coloured passport size photographs to be placed along the visa form (35mm X 45mm, 80% face close up, matte finish,white background only). the colour of your top must be in contrast to the white background. One photograph to be pasted on the Singapore tourist visa form and signed across. The second photograph should be attached with a gem clip along with the form. The photograph should not be older than 3 months. 6. In case you have more than 4-5 hours in between your connecting flights, you can opt for a free Singapore tour by registering yourself at the Changi Airport for the same. This is only applicable if your halt is less than 8 hours, otherwise you'd need a transit visa. 7. Apart from this, applicants should also have sufficient funds for the period of stay in Singapore along with confirmed return flight tickets. 1. Download the Singapore tourist visa form online and complete it with information and signature. 2. Ensure that your passport is within a validity of 6 months from the date of arrival in Singapore. 3. A confirmed return air ticket with the tour itinerary is necessary. 4. A covering letter from the applicant mentioning the reason of travel and dates of travel, addressed to ‘The Embassy of Singapore /The Consulate General of Singapore’. 5. A leave letter from the applicant’s company on the company letterhead. 6. Please ensure that all the documents are in English. If not, then official translations of the documents should also be attached. 7. If the applicant is residing on any other address than mentioned on the passport, then the residential proof copy should also be attached. Two government authorised address proofs with the same address need to be attached. 8. If you are a first time traveller to Singapore, then there is a need to attach income tax papers of last 3 years along with bank statements of last 3 months. 9. It will be good to attach the confirmed bookings of your hotel in Singapore, although it is not a mandate. 10. Moreover, the consulate has the right to ask for additional documents as deemed necessary. Once the above steps are undergone, Singapore isn't that far away! Let the garden-city enthrall you with its magic; customise your Singapore package today!